St. George Terminal is a ferry, railway, bus, and park and ride transit center in the St. George neighborhood of Staten Island, New York City. It is located at the intersection of Richmond Terrace and Bay Street, near Staten Island Borough Hall, Richmond County Bank Ballpark and Richmond County Supreme Court. St. George is one of the few remaining rail-sea connections in the United States. A new ferry and rail terminal at the St. George site (then called St. George's Landing) and an extension of the Staten Island Railway (then called Staten Island Rapid Transit or SIRT) north from Vanderbilt's Landing (today's Clifton Station) had been proposed in the 1870s by the owners of the Staten Island Railroad, George Law, Cornelius Vanderbilt, and Erastus Wiman, to replace the various ferry sites on the north and east shores Staten Island. 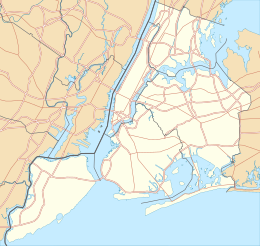 St. George was selected due to it being the closest point from Staten Island to Manhattan, approximately a 5 miles (8.0 km) distance. The name of the terminal and the local neighborhood were renamed to St. George in honor of Law, allegedly as a concession by Wiman in order to build the terminal and connecting tunnel on land owned by Law. An extension of the line to Tompkinsville was opened in 1884, and the underground tunnel between Tompkinsville and the terminal was constructed from 1884 to 1885. The ferry terminal was opened in early 1886, while the rail terminal opened in March of that year. The terminal's entrance building would be opened in 1897. The St. George rail terminal as originally built was constructed of wood, with no overhead obstructions. Adjacent to the station was a large freight terminal called the St. George Yard, where the Baltimore and Ohio Railroad's freight operations exchanged with car floats to other terminals in the New York Harbor. The B&O also operated the SIRT and ferries under a 99-year lease signed in 1885. A trolley terminal for the Staten Island Electric Company was formerly located above the ferryhouse. The St. George tunnel was lengthened in 1905. It was built with two portals at its north end; one on the geographic east side currently in use by the SIR, and an additional western portal intended for the Staten Island Tunnel, which would have traveled across the Narrows and connected to the New York City Subway's BMT Fourth Avenue Line in Brooklyn. In 1923 an excavation shaft for the Narrows tunnel was constructed at the south end of the terminal near Shore Road, though construction was halted in 1925. On June 25, 1946, a large fire destroyed both the wooden ferry and rail terminals. Full service was restored in July of that year. A new facility was built by the city, opening on June 8, 1951, which led the tunneling shaft to be filled in. The new facility cost $21 million. The former freight yard was replaced by a NYCDOT Municipal Parking Lot when the new terminal opened, and is now also the site of the Richmond County Bank Ballpark. The station served as the northern (eastern) terminus for the SIR North Shore Branch to Arlington and Port Ivory until its closure in 1953. The line used tracks 11 and 12 on the north end of the terminal, which are currently unused. Plans for a renovation of the ferry terminal were announced in March 1997, and it received renovations in the 2000s as part of a $300 million renovation of several ferry terminals in the area, including the St. George and Whitehall Terminals. 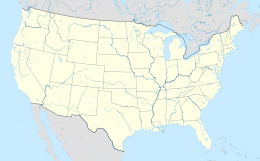 Currently, St. George hosts a direct rail-sea connection, one of a few left in the United States. St. George Terminal is the southern terminal of the Staten Island Ferry; it runs only to Whitehall Terminal, on the southern tip of Manhattan near Battery Park. The Staten Island Ferry runs a 24-hour service between the two. During rush hours, ferries usually run at 15-to-20-minute intervals, decreasing to 30 minutes during the mid-days and evenings. For a few hours during the early morning, usually 12 a.m. to 6 a.m., a ferry is provided once every 30 minutes. During the weekends ferries run every 30 minutes. In November 2006, additional ferries running every 30 minutes were provided during the weekend morning hours, the most significant change in the ferry schedule for about three decades. In 2015, weekend-morning and late-night frequencies were increased to every thirty minutes. In January 2019, NYC Ferry announced that it would start operating its St. George route. The route would run from the St. George ferry terminal to Battery Park City Ferry Terminal and West Midtown Ferry Terminal in Manhattan. Service on this route will begin in 2020. The rail station, signed as St. George, which opened on March 7, 1886, is the northern terminus of the main line of the Staten Island Railway. Service is provided 24 hours a day, every day. It is also one of two stations that require the US$2.75 fare on entry and exit, the other being Tompkinsville. This station is handicapped accessible and it is compliant with the Americans with Disabilities Act. This station is situated in an open cut below street level, with a four-lane bus terminal and parking lot above it. The station has five active platforms and ten tracks, numbered 1 through 10 from east to west. All tracks end at bumper blocks at their railroad northern (geographic eastern) ends. There is also a sixth island platform with two additional tracks (11 and 12) to the west (geographic north) no longer in revenue service, which historically served the SIRT's North Shore Branch. It currently acts as a passageway to the North Municipal Parking Field on Richmond Terrace, and towards Richmond County Bank Ballpark, one of two access points to this station. The track ballast is present through this construction zone. The mezzanine area has separate fare control areas: the east side for passengers entering, and the west side is for passengers exiting. Station booths and MetroCard vending machines are located on both sides. Just before each platform bay are the old destination indicators to the left and right of each platform entrance, corresponding to each departing track. There are green bulbs above these displays that indicate where the next train will be leaving from. This station originally opened with nothing overhead; no bus bays and no ramps. It was the site of a 1946 fire that nearly destroyed the terminal. Just south of the station towards Tompkinsville, the SIR runs in the system's only tunnel, known as the St. George Tunnel. 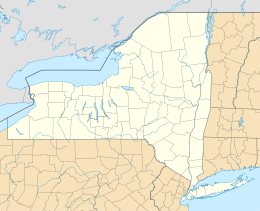 The Metropolitan Transportation Authority operates a number of bus routes in Staten Island, New York, United States. Some of them are the direct descendants of streetcar lines (see list of streetcar lines in Staten Island). Departures are given below by loading bay. S91 PM rush-only limited-stop service. S92 PM rush-only limited-stop service. S81 PM rush-only limited-stop service. S84 PM rush-only limited-stop service. S86 PM rush-only limited-stop service. S96 PM rush-only limited-stop service. S98 PM rush-only limited-stop service. S90 PM rush-only limited-stop service. S94 PM rush-only limited-stop service. ^ a b "Rapid Transit on Staten Island" (PDF). nytimes.com. The New York Times. January 17, 1886. Retrieved July 24, 2015. ^ a b c d e f Roger P. Roess; Gene Sansone (August 23, 2012). The Wheels That Drove New York: A History of the New York City Transit System. Springer Science & Business Media. pp. 416–. ISBN 978-3-642-30484-2. ^ "Staten Islanders Worried: Anxious to Know Who Will Run the Ferryboats to This City" (PDF). nytimes.com. The New York Times. May 25, 1893. Retrieved July 24, 2015. ^ a b c d e f g h Leigh, Irvin; Matus, Paul (January 2002). "State Island Rapid Transit: The Essential History". thethirdrail.net. The Third Rail Online. Retrieved June 27, 2015. ^ a b Minn, Michael (December 18, 2009). "History and Future of the North Shore Rail Line on Staten Island" (PDF). michaelminn.net. Archived from the original (PDF) on June 1, 2015. Retrieved August 1, 2015. ^ "Staten Island Ferry Terminal Named to 'Canonize' George Law" (PDF). The New York Times. May 26, 1929. Retrieved October 8, 2015. ^ Waite, Thomas L. (July 19, 1987). "IF YOU'RE THINKING OF LIVING IN; ST. GEORGE". The New York Times. Retrieved October 8, 2015. ^ a b c d e f g Pitanza, Marc (2015). Staten Island Rapid Transit Images of Rail. Arcadia Publishing. ISBN 978-1-4671-2338-9. ^ a b "Staten Island's Rapid Transit: The New System Which Lessens Time and Increases Facilities" (PDF). nytimes.com. The New York Times. March 9, 1886. Retrieved July 24, 2015. ^ Staten Island Advance (March 27, 2011). "For Erastus Wiman, St. George was a golden opportunity". SILive.com. Staten Island, New York: Staten Island Advance. Retrieved October 8, 2015. ^ a b c d e "The City of New York Board of Estimate and Apportionment: The Narrows Tunnel" (PDF). brooklynrail.net. New York City Board of Estimate, Brooklyn Historic Railway Association. 1925. Retrieved August 21, 2015. ^ "Two Fires on Staten Island: Ferryhouse at St. George and Overhead Trolley Structure Badly Damaged—Blaze at Cricket Club" (PDF). nytimes.com. The New York Times. November 13, 1899. Retrieved July 31, 2015. ^ "Hylan Swings Pick at Shaft Opening; Formally Starts Work at the Staten Island End of Narrows Tunnel" (PDF). The New York Times. July 20, 1923. Retrieved September 6, 2016. ^ a b c "New Ferry Depot Will 'Open' Today: Mayor to Dedicate Terminal at Staten Island That Has Been Used in Part for Year" (PDF). The New York Times. June 8, 1951. Retrieved September 6, 2016. ^ Matteo, Thomas (November 12, 2014). "Our Changing Island: Site of former B&O rail yards, St. George". SILive.com. Staten Island, New York: Staten Island Advance. Retrieved October 8, 2015. ^ "Municipal Parking Facilities". New York City Department of Transportation. ^ a b Office of Diane J. Savino (2013). "State Senator Diane J. Savino's 2013 Staten Island Railway Rider Report" (PDF). nysenate.gov. New York State Senate. Retrieved July 31, 2015. ^ Chen, David W. (March 20, 1997). "Sleeker Design for Staten Island Ferry Terminal Is Unveiled". The New York Times. ISSN 0362-4331. Retrieved November 14, 2017. ^ Dunlap, David W. (April 7, 2002). "Launching a Flotilla of Ferry Terminals". The New York Times. ISSN 0362-4331. Retrieved September 23, 2017. ^ "St. George, Staten Island: THE BOROUGH'S TRANSIT, CIVIC AND CULTURAL HUB" (PDF). nyc.gov. New York City Economic Development Corporation. August 2011. p. 2. ^ Sanders, Anna (May 6, 2015). "Staten Island Ferry expected to run at least every 30 minutes starting this fall". SILive.com. Archived from the original on May 8, 2015. Retrieved May 7, 2016. ^ Fitzsimmons, Emma G. (April 1, 2015). "Staten Island Ferry to Add More Early Morning Trips". The New York Times. ISSN 0362-4331. Retrieved September 19, 2017. ^ "Routes and Schedules: St. George". NYC Ferry. ^ "NYC Ferry is adding 2 new routes". am New York. January 10, 2019. Retrieved January 11, 2019. ^ Plitt, Amy (January 10, 2019). "NYC Ferry will launch service to Staten Island, Coney Island". Curbed NY. Retrieved January 11, 2019. ^ "2020-2021 Expansion". New York City Ferry Service. Retrieved January 11, 2019. ^ "North Shore line". Archived from the original on July 24, 2011. ^ "MTA NYC Transit - Staten Island Railway Strip map (including bus transfers and parking)". Retrieved February 26, 2009. ^ "Feasibility Study of the North Shore Railroad Right-of-Way Project Assessment Report March 2004" (PDF). library.wagner.edu. Office of the Staten Island Borough President, Port Authority of New York and New Jersey, URS, SYSTRA,. March 2004. Retrieved August 6, 2015. ^ "6.5: TRANSIT AND RAILROAD OPEN CUTS: STATEN ISLAND" (PDF). nyc.gov. New York City Department of City Planning. Archived from the original (PDF) on June 6, 2010. Retrieved August 6, 2015. Wikimedia Commons has media related to St. George Terminal. This page was last edited on 12 January 2019, at 04:31 (UTC).